There's more to Windows 7 than meets the eye. These nondefault features may be useful in your enterprise. 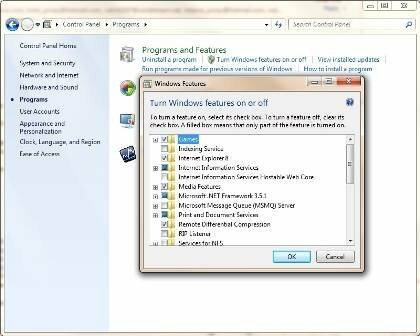 When defining a Windows desktop configuration, many administrators start with a default Windows deployment and then lock down the settings and features they don't want users to access. While this approach works, it's based on the assumption that a default installation includes all of the features available for that particular version of the operating system. This isn't necessarily the case. To access these nondefault features, open the Control Panel and click on Programs. In the Programs and Features section, click the Turn Windows Features On or Off link. When you do this, Windows will display a dialog box where you can enable or disable several features, as shown in Figure 1. The Indexing Service is one of the most useful nondefault features. It indexes the local hard disk -- and in some cases, remote content -- so that users can locate content through flexible queries. The Indexing Service was in Windows Vista, but many people complained that it was slow. Since the Indexing Service is a bit resource-intensive, Microsoft disabled it by default in Windows 7 to boost performance. Although Internet Information Services (IIS) is typically thought of as a server component, it's included with Windows 7 and enables a Windows 7 machine to operate as a Web server. While you probably don't want your users hosting websites on their corporate desktops, this feature can comes in handy. For example, certain applications depend on a Web interface, and if you want to run these apps locally, IIS needs to be installed. Like IIS, Internet Information Services Hostable Web Core (HWC) is a Web server that can run on a Windows desktop. However, HWC has a much smaller footprint than IIS and some rather significant limitations. For example, it only supports a single website or Web service, and therefore offers only a single application pool. It also has very limited monitoring capabilities and is intended to be managed remotely. The Microsoft Message Queue Server (MSMQ) is a legacy service designed to improve communications across unreliable networks. Communications are cached within a queue so if a connection drops intermittently, messages will still reach its destination. This component listens for Routing Information Protocol (RIP) v1 updates. As a result, Windows will know of routing table changes. However, since RIP Listener is a legacy service, it won't help you if you have a network with a lot of different segments because RIPv1 does not broadcast the necessary subnet mask information. Microsoft Services for Network File System (NFS) allows Windows 7 to access Unix/Linux file shares through the NFS protocol. Although this service isn't new, Microsoft made several changes to it in Windows 7, including improving performance and adding support for multiple versions of Linux and Unix. It also included an Active Directory lookup feature that allows Windows to do Unix account mapping. Note that several services for NFS features -- like the Gateway for NFS, Server for PCNFS, User Name Mapping and all PCNFS components -- have be discontinued. The Simple Network Management Protocol (SNMP) probably isn't something that you would provide to end users, but administrators may find it useful. SNMP allows you to manage various devices on your network. You can use it to configure network hardware, track down network faults and, in some cases, even track unauthorized access attempts. Microsoft removed several legacy TCP/IP services from Windows 7, including Character Generator (CHARGEN), Daytime, Discard, Echo and Quote of the Day (QUOTE).To get them back, install the Simple TCP/IP Services. Windows Remote Assistance: Friend or foe? Another useful service is the Subsystem for Unix-based Applications, a source-compatibility subsystem that lets you to compile or run Unix applications on Windows. This can be particularly helpful if your users need to run open source applications. Telnet Server turns Windows 7 into a Telnet host, and it's another service that you probably shouldn't allow users to run. The TFTP Client is a command-line version of the Trivial File Transfer Protocol. Although you may occasionally need to use the TFTP client to transfer files to or from a remote host, it's safe to assume that most end users would not know what to do with it. The Windows TIFF IFilter performs optical character recognition on Tag Image File Format (TIFF) files, so that the text within those files can be indexed. Microsoft didn't enable this component by default because optical character recognition is very resource-intensive. However, if your users have a lot of TIFF files, then the performance hit may be worth the benefit. Brien M. Posey, MCSE, has received Microsoft's Most Valuable Professional Award seven times for his work with Windows Server, IIS and Exchange Server. He has served as CIO for a nationwide chain of hospitals and health care facilities and was once a network administrator for Fort Knox. You can visit his personal website at www.brienposey.com.